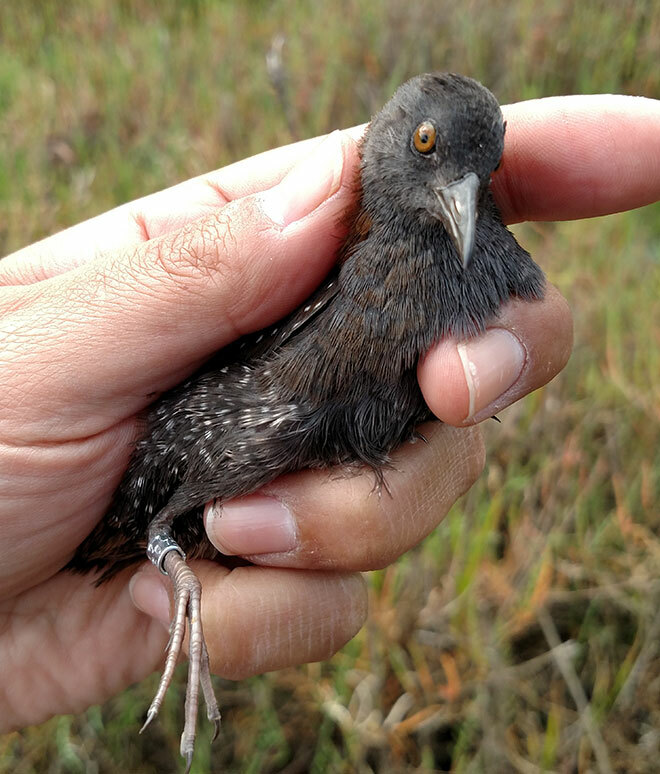 A Black Rail is back again where it belongs – hiding in nature. 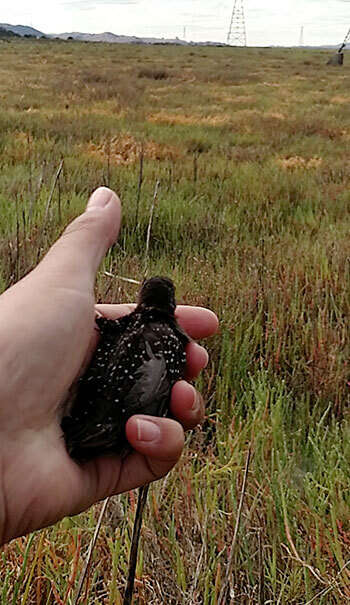 Staff from our San Francisco Bay Center released the hatchling year Black Rail after came to us via WildCare after being rescued in Novato. It arrived on May 25, 2015 weighing 11 grams. It found with a small wound on its left elbow. It more than doubled its weight to 24 grams before being released on June 26th at Black Point in Novato, CA. Black Rails are super secretive as it walks or runs through shallow salt and freshwater marshes. It is rarely seen in flight. It’s the smallest of all Rails. 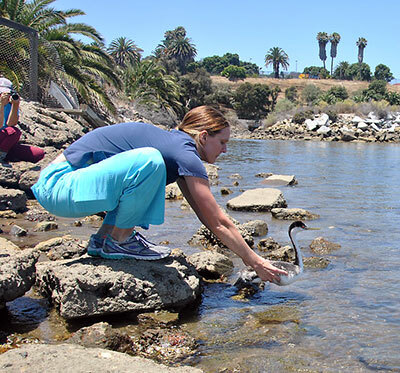 On Friday our team in Southern California released a rehabilitated Western Grebe from the Refugio Oil Spill. This is the first non-Pelican affected by the spill to be released. 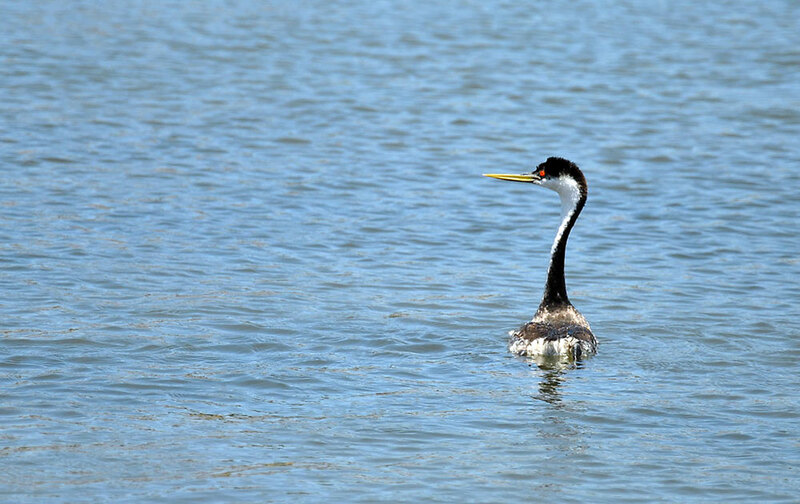 The heavily oiled Grebe was collected on May 22, 2015 from the drainage ditch east of of Venadito Creek in Santa Barbara County. After being washed and recovering from various secondary injuries at our Los Angeles Center, it was released late this week at Cabrillo Beach in San Pedro. 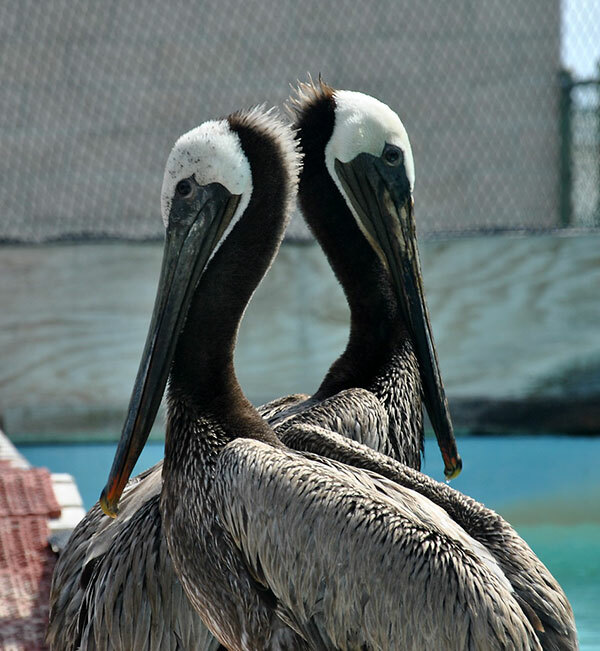 More than 50 oiled seabirds – mainly Brown Pelicans – have come to the center rescued in Santa Barbara and Ventura Counties. 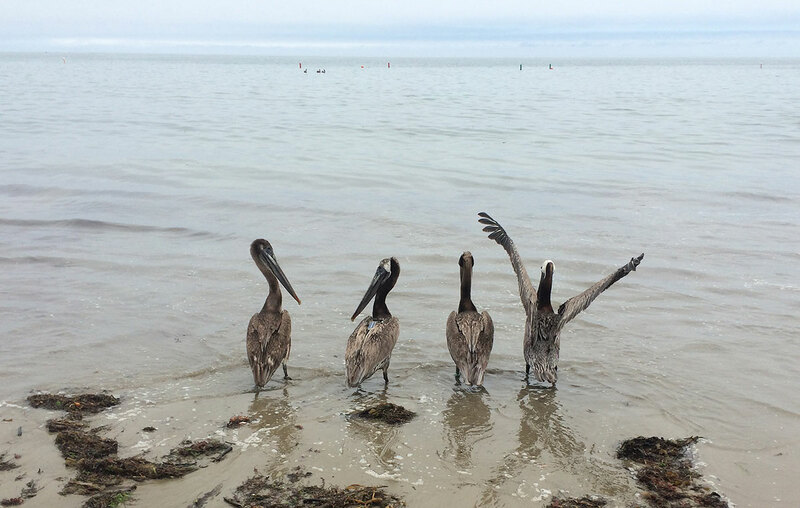 The birds were oiled at May 19th Refugio oil pipeline break that spilled more than 100,000 gallons of crude. As a member of the Oiled Wildlife Care Network (OWCN) the center near the Los Angeles Harbor has been ground zero for this oiled seabird response. International Bird Rescue staff and volunteers, along with other OWCN members, have worked tirelessly to help care for the effected birds. There’s nothing quite like a bird release to stir your soul. On Friday we happily helped release the first 10 clean, rehabilitated Pelicans back to the wild at Goleta Beach. All of these majestic seabirds were oiled in the May 19th Refugio oil spill in Santa Barbara. 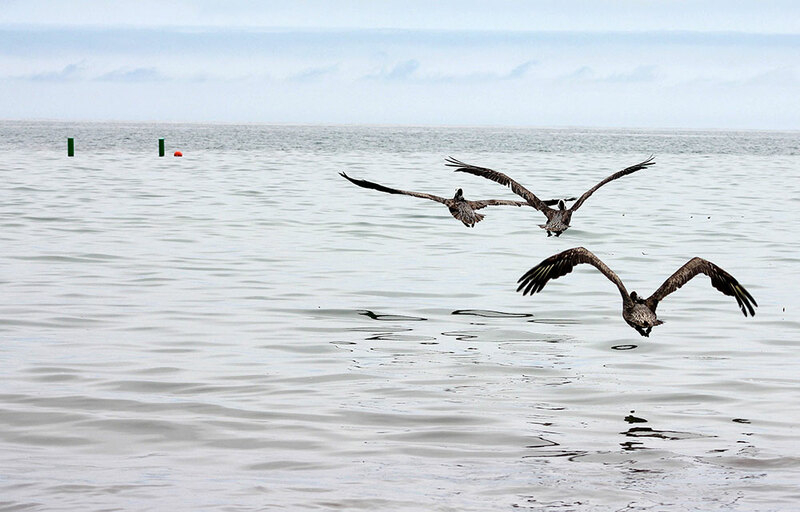 The awe inspiring sight of these Brown Pelicans returning home gave us all renewed hope that humans can and will work to help heal oiled wildlife. 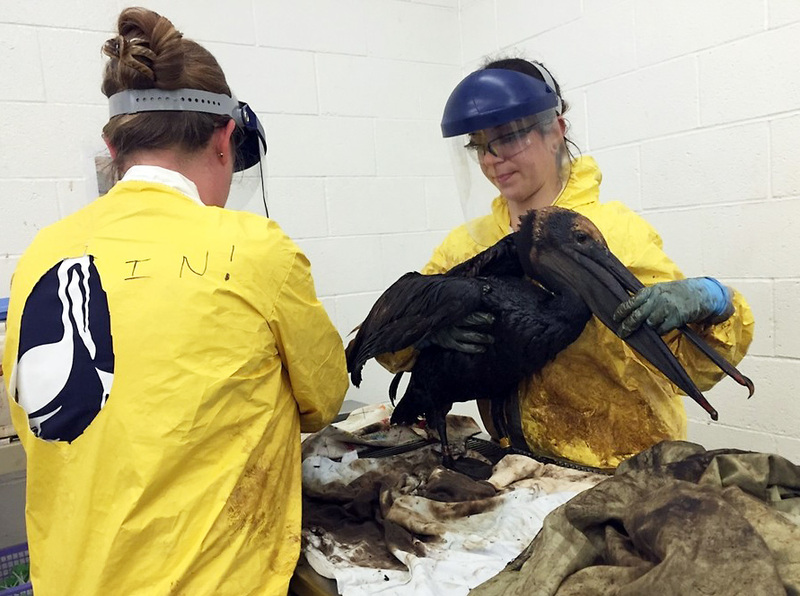 More than 50 oiled birds have come to the San Pedro center – mainly Pelicans rescued in the Pacific Ocean from Refugio south to Ventura County. As a proud member of the Oiled Wildlife Care Network (OWCN) the center near the Los Angeles Harbor was at ground zero for this oiled seabird response. International Bird Rescue staff and volunteers, along with other OWCN members, worked tirelessly to help care for the effected birds. 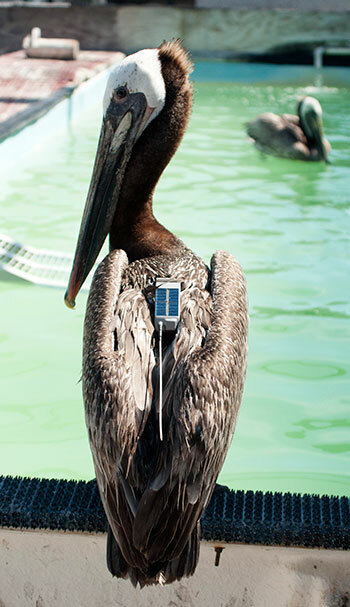 As part of the research aspect of the spill response, five Pelicans were outfitted with solar-powered satellite tracking devices. This will help OWCN scientists track and study the rescued birds. As always, we appreciate all the kind words and notes of encouragement for our role in helping to make sure “Every Bird Matters”. P.S. 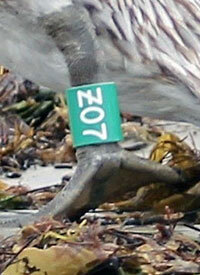 – If you spot a banded Brown Pelican with a special “Z” leg numbered band, please report it to the OWCN tip line: 1-877-UCD-OWCN. Two weeks after oiled seabirds from the Refugio Oil Incident began arriving into our San Pedro Center, many have been washed and are now recuperating in two large outside bird aviaries. 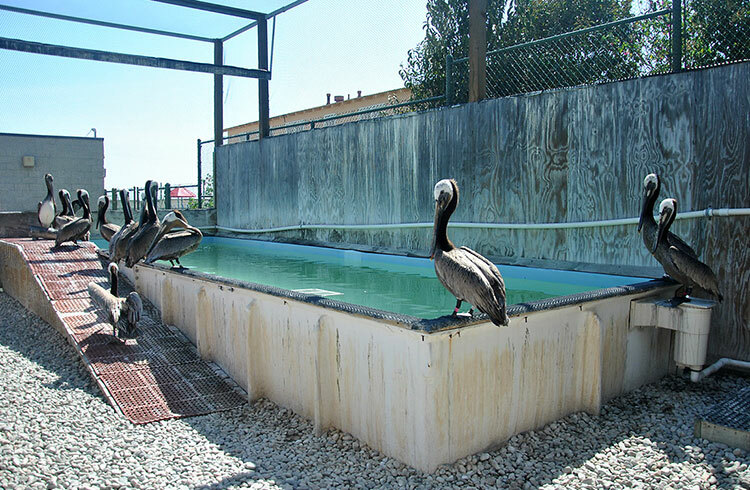 Most of the birds in care are California Brown Pelicans. These are majestic birds with a height of more than 4 feet, weighing upwards of 11 pounds (5000 g) and with a wingspan 6+ feet. 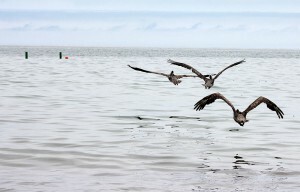 At least 40 Brown Pelicans are in care and upwards of 36 have been washed of the oil that coated their wings after a pipeline burst at Refugio State Beach on May 19th. 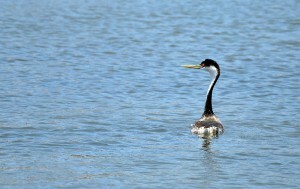 Other bird species in care include Western Gulls, Western Grebes, Common Murres, a Surf Scoter, and a Pacific Loon. As of Wednesday night, June 3, search and collection teams have rescued 58 live birds and 42 live marine mammals. Dead animals collected included 115 seabirds and 58 mammals. A 24-inch underground pipeline burst about 20 miles NW of Santa Barbara. At least 100,000 gallons of crude oil leaked from the broken pipe, including an estimated 21,000 gallons that washed into a storm drain and flowed out to the Pacific Ocean. As a member of California’s Oiled Wildlife Care Network our wildlife responders were activated to help with search and collection and treatment and washing of affected seabirds. Our center in San Pedro near the Los Angeles Harbor is fully staffed with multiple washing stations and two aviaries – one that is large flight aviary.